We expect the Riksbank's February meeting to be largely a non-event. The central bank is unlikely to shift policy meaningfully so soon after the December meeting when the policy rate increased to -0.25% but the interest rate forecast was revised down (a very dovish hike), and forecasts for growth and inflation were revised down (again). Since then, the outlook for the Swedish economy has worsened further, both due to domestic factors and a now clearly a slowing global economy. Survey data points to a marked loss of momentum in the domestic economy, both due to the export sector suffering from lower growth in trading partners and the housing market slowdown in Sweden. 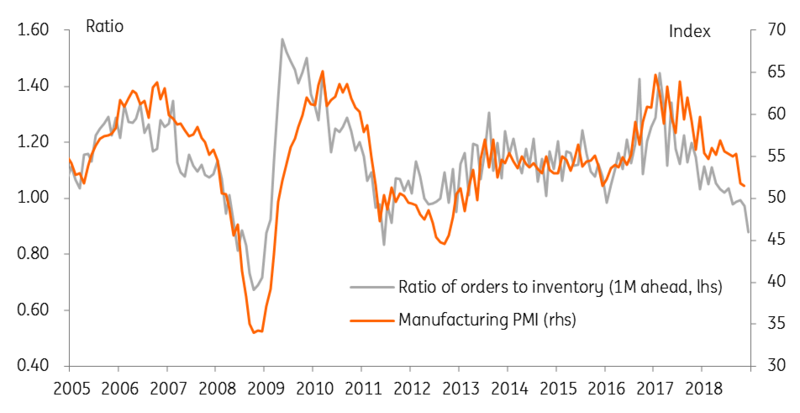 The manufacturing PMI has fallen to 51.5, and the ratio of orders to inventory suggests we are likely to see the PMI fall below 50 in coming months, indicating a contraction in the manufacturing sector. House prices have also started falling again, and a large amount of outstanding supply suggests risks remain to the downside. There are also increasing signs that the housing market troubles are affecting households, with consumption in 4Q18 likely to come in lower than 4Q17 as consumers tighten their belts. On the positive side, the December inflation figure came out in line with the Riksbank’s forecast (for only the third month in 2018). In particular, core inflation and the service sector component rose, and we think that at least over the next few months, core inflation will stay largely in line with the Riksbank’s forecast, mainly because the forecast has been revised down continuously through 2018. Remember that this time last year the Riksbank was forecasting core inflation to have reached 2% by now, whereas the December reading was only 1.5%. Now, the Riksbank doesn't see core reaching 2% until late 2020. Another key consideration is the Swedish krona has depreciated by around 2.5% since the start of 2019, in contrast to the Riksbank’s expectations of a gradual appreciation. The krona's depreciation is even more remarkable given the bounce-back in risky asset prices globally during January, which would typically be associated with a stronger krona. 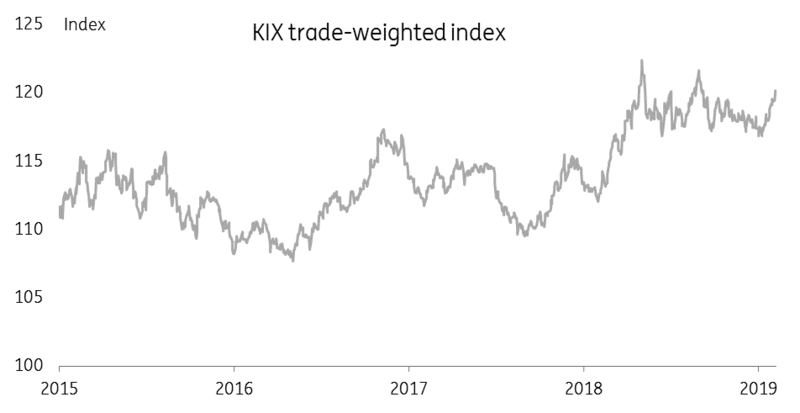 While this will mechanically push up a little on growth and inflation in the Riksbank’s forecast, the current level of the exchange rate (whether looking at EUR/SEK or the KIX TWI) is close to the levels seen in May and September last year. It’s worth bearing in mind that on both those occasions the Riksbank came out with somewhat more hawkish communication, which appeared at least in part driven by a desire to keep the exchange rate from depreciating further. Piecing this together, we expect a somewhat more cautious tone in the February statement, though perhaps not as dovish as markets may be expecting given how weak the exchange rate already is. In other words, the Riksbank is likely to mirror the slightly more dovish stance taken by the ECB and Bank of England over the past couple of weeks, acknowledging the deteriorating data but not shifting the policy stance materially. That said, we anticipate another downward revision to the interest rate forecast in April, as growth is likely to deteriorate further. This would put the next rate hike in 4Q19 at the earliest, and there is a clear and growing risk that the Riksbank proves unable to hike at all this year. We also expect the April meeting will include an announcement that QE reinvestments will be extended to the end of 2020, though probably at a reduced rate.